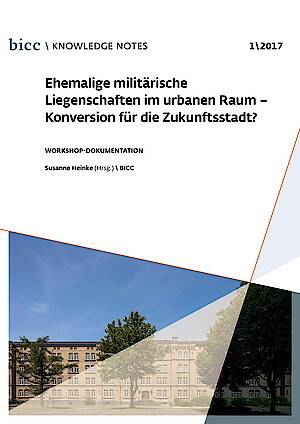 On 19 May 2016, BICC hosted the one-day international expert workshop “Former military sites in urban space—Conversion for the city of the future?” in Bonn. BICC Knowledge Note 1\2017 documents the results. The workshop hoped to find answers to the question which impulses the conversion of former military buildings could give to a city’s future development. On the one hand, base conversion has come into the limelight once again with more urban living space needed for refugees. This occupies not only political and urban development planning but also refugee/displacement- and peace and conflict studies. On the other hand, BICC is interested in approaching the remembrance value of former military sites from the angle of peace research. Representatives from the research fields of the preservation of historical monuments, geography and urban development as well as policymakers and historians met with experts from the state-, federal- and community level and civil society in transdisciplinary discussions on “Conversion for the city of the future”. Examples from Italy and the United Kingdom deepened the participants’ understanding that conversion more than ever represents a significant part of a dynamic urban neighbourhood development.